Do you ever get confused about where all the mines and batteries were located on the Thames Goldfield? One of the most confusing areas for me is around the present Goldmine Experience area. The area north of Burke Street to Kuranui Bay has changed so much geographically, its hard to make sense of old photographs. Anyway a new gem in the Sir George Grey Collections at Auckland Libraries has solved one of these location dilemmas - and a plan received from Tom, shows the exact location. Have you seen the heritage sign at the western border of the Goldmine Experience? 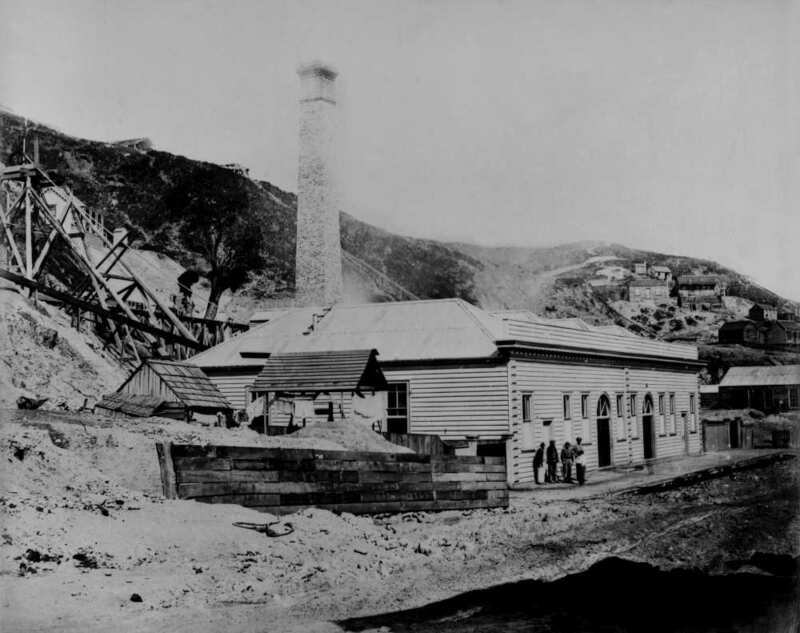 The above photograph is of the Golden Crown Battery and Mine site, to the east of Golden Crown aka Owen Street. Referenced as being taken 1870-1879. The hill to the top right is the Waiotahi Spur, the area where the WWI Peace Memorial is located. The view to the right is looking down Owen Street to the right, the Golden Crown Battery can be seen lower right. Far lower right is the intersection of Haven and Golden Crown Street, which on later maps is a continuation of Owen Street. 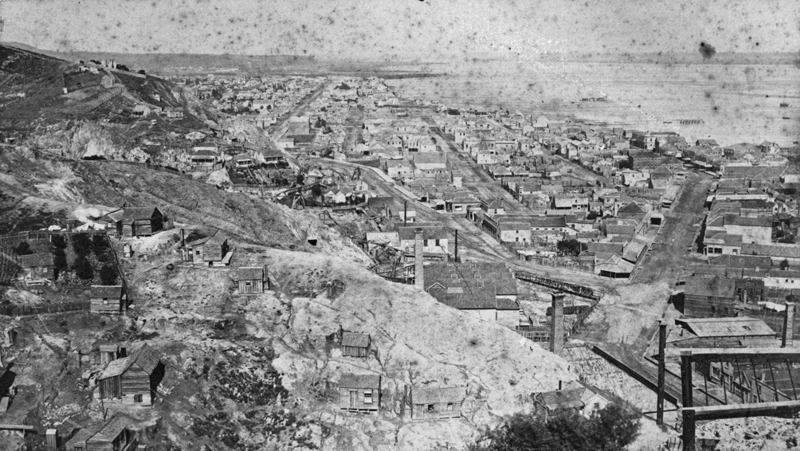 The photograph below is a close-up of the area, and the Golden Crown Battery is to the left of the wording "Golden Crown Street." ABOVE: Part of the NZ Survey Dept IV Thames Map 1897. Golden Crown Battery site marked far right, opposite Haven Street intersect, and running south along Owen Street. BELOW: Google earth view of the area today. Tons of Quartz: 32,483; Yield of Bullion: 91,760; Value of Bullion: 248,896 Pounds. Source: Gold-Mines of the Hauraki District, by J F Downey, 1935. 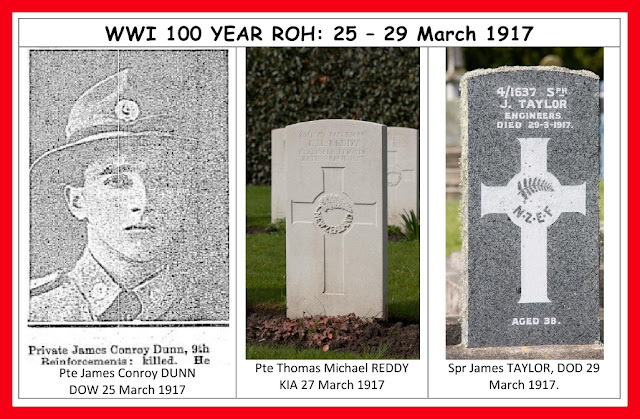 Private James Conroy DUNN, #12/3623 DOW 25 March 1917 in the field of France. James Dunn was the son of Margaret Ann Dunn, of Queen St., Thames, New Zealand, and the late James Dunn James Dunn was the son of Margaret Ann Dunn, of Queen St., Thames, New Zealand, and the late James Dunn. Private Thomas Michael REDDY, #26/1179, KIA 27 March 1917 in the field of France. Next of Kin Mrs Annie Reddy (wife), Karaka Road, Thames, New Zealand. Sapper James TAYLOR, #4/1637, DOD 29 March 1917 at Waihi, New Zealand. Son of James and Ellen Taylor of "Khandallah", Conway Road, Bankstown, Sydney, New South Wales, Australia. 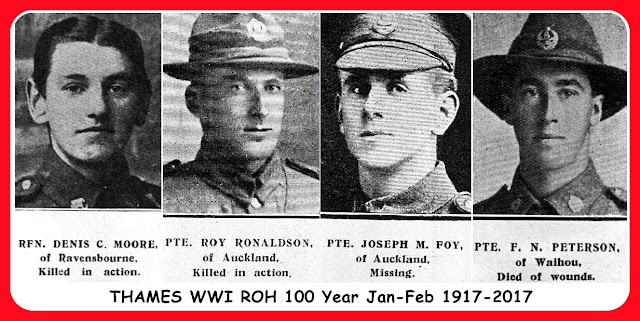 Since closing my facebook site, I have been remiss in not keeping up-to-date the names of our WWI ROH on the date of their 100 year anniversary. A full list of our World War One Roll of Honour names has been recorded in date order, so that you can scroll down and view all the men who were classified as war deaths. Remember there is also a slideshow that has where possible a photo of our WWI ROH soldiers. So far this year, one hundred years ago four soldiers from Thames had died in 1917. Be prepared 1917 will see many names listed, as casualties were great. Refer to the WWI ROH list for details. UPDATE: 13 March 2017. Don't forget the book launch THIS week. Kae will have books for sale, they are $85 and apparently jam packed with heaps of information that should meet the needs of the family researcher to mining enthusiast. Announcement today on the TCDC news-page of a book launch during Thames Heritage Festival. 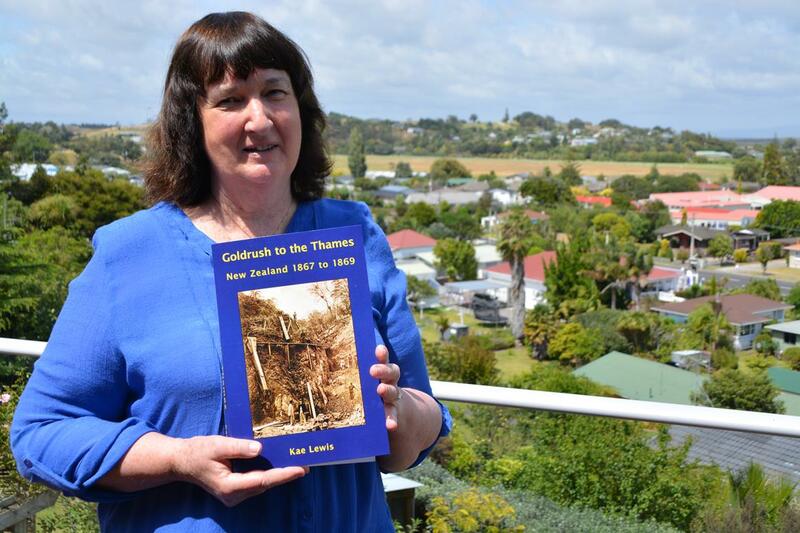 Goldrush to the Thames New Zealand 1867 to 1869 is written by Kae Lewis. Kae is better known to most as The Treasury Webmaster and the creator of the Goldminers Database. Full details on the book are available at the TCDC link. "With the 150th anniversary of the proclamation of the Thames Goldfield in August, Kae has written a book Goldrush to the Thames New Zealand 1867-1869 as a companion to the website, and there will be an initial print run of just 100 copies available." There are two book launches scheduled: at The Treasury on Wednesday March 15th and at Thames Coromandel District Libraries on Thursday March 16th. Copies will also be available at Thames School of Mines Shop and Carsons Book shop.